This student was 22 years old and suffered from primary hypertension. The next day he told me that his blood pressure had returned to normal. This experience made me experiment with another hypertension patient, a woman of 40 who had been suffering from hypertension for a long time. I did the same as before and she also experienced the sensation of cold sweat going down the body and a normalization of her blood pressure afterwards. One day, some of my Tai Chi students brought one of their fellow students. He had been doing pushing hands with another student and received a strong punch in the chest, after which his chest felt very painful. As usual I used my right hand, put it on the student’s chest and made vibration force enter his chest. However, not only did the pain not leave but it became even worse. After ten minutes I decided I could not help him, so I pulled back my hand. As I moved my hand away from his body, I felt like something was following my hand. Strangely, the moment my hand left his chest, the pain stopped. These experiences set me to thinking and researching these phenomena thoroughly. I called these phenomena ‘binqi’ in analogy to the ancient concept of bingqi. Because of certain similarities but also many differences, I decided to use the same word except for the ‘g’ which was omitted. As I made more and more use of the binqi theory in my medical practice, new perspectives opened up for its application not only in the buqi system, but also in herbal therapy, acupuncture and other therapies. The word binqi has been found in the Shang Hanlun by Zhang Chongjing who says “Bingqi is xieqi”. (The term xieqi is sometimes simplified to xie). The word xie(xieqi) stems from the Huandi Neijin which explains that if the body has enough zheng, then xie cannot attack. Xie attacks the body because it does not have enough qi(i.e. zhengqi). These two sentences led to the development of an important theory of TCM which is called ‘Zheng xie run’ or ‘the theory of healthy qi and sick qi’. Up to the present day TCM practitioners often use this theory in treating patients: in the case of insufficient healthy qim reinforce or tonify (bu), in the case of too much sick qi, expel or purge (xie). In the Huandi Neijin, six different kinds of xieqi are discussed. In the chapter Jiu Tong Ren it is written ‘Any disease of people stems from Feng, Han, Shi, Zhao and Hou’. Different chapters of the Huandi Neijin use different terms to refer to these six different kinds of xieqi: liuyin, liuxie and liuqi are used to refer to these six chinese words. The literal translation of liuyin and liuxie is ‘six external causes of disease’, i.e. six meteorological phenomena, namely wind, cold, damp, summer-heat, dryness and fire. Therefore they are also called liuqi meaning six meteorological phenomena. I think that wind-forces can directly influence the external receptors of the body. The different seasons have different temperature and humidity levels which make it possible for different kinds of micro-organisms to develop, thus causing different kinds of infections. The chapter Jiu Teng Ren of the Huandi Neijin, gives a very detailed analysis about the link between cold and diseases, proposing that pain originates because cold stagnates in the channels. The chapter Bi Ren emphasizes that a disease can be caused by one or more elements of liuyin stating that cold, wind and damp can create numbness. Within the field of TCM, people have thought a lot about the six kinds of xieqi. They have discussed their cause and effect and differentiated between internal and external xieqi. Not only in ancient times but even today TCM theory subscribes to the viewpoint that the meteorological phenomena wind, cold, damp, summer-heat, dryness and fire are a direct cause of disease. In buqi, the range of different binqi are considered as direct pathogenic factors. They accumulate in the intervertebral spaces, organs, muscles, tissues, joints and channels. Binqi cannot only accumulate in one placem but is able to move in and out of the body. Any area of the body in which binqi has accumulated or to which binqi has moved, will experience uncomfortable sensations such as cold, heat, itchingm stiffness, pain, etc. As a result that area will become weaker, there will be varied symptoms, and after a certain time different diseases will develop. Different kinds of binqi result in different sensations, not only in the patient but also for the buqi-practitioner. Wind-binqi (Feng): The patient experiences wind-binqi as cold, stiffness or pain. During a buqi treatment the practitioner can feel wind-binqi as a cold breeze leaving the affected area of the patient via the skin. The patient can feel that something is moving down the body towards the extremities and leaving the body via the hands and the feet, or directly out of the affected area. A sign that wind-binqi is leaving the body is a change of colour under the skin in those areas: it turns blue. Because wind-binqi leaves the body easily and quickly, the colour of the hands and feet will normalize again when the binqi has left the body. From these phenomena we conclude that wind-binqi involves different kinds of gases. This gas accumulates and stagnates in and moves to certain areas of the body, which then become rigid, painful or numb. If this process continues over a longer period, it will affect the organs. Cold-binqi (han): The patient experiences cold-binqi as a cold area in the body. During a buqi treat;ent the practitioner also feels that this area is cold and can see the colour of the hands of the patient turning blue because cold makes the micro-vessels contract. During the treatment cold noves slowly to the natural exits of the body. In most people the cold will then concentrate in the fingers or toes and the colour of the rest of the hands or the feet will normalize again. The fingers and toes will be colder than before. What is the nature of this cold-binqi? In the muscles a certain element is present that takes warmth away. I did some chemical research in my laboratory in Xinjiang related to the composition of this element. My research consisted of analysing two samples of blood from the same muscle, one taken before treatment and one after treatment. Seven people took part. I observed a change of volume of ammonium chloride in the blood: before treatment it was higher than normal and after treatment it was back to normal. only this kind of research has not been done with an enough large number of people so there has never been a scientific report of it. Ammonium chloride has a capacity to absorb warmth. A cooling down of a certain area of the body will diminish the blood circulation. Damp-binqi (shi): The patient experiences damp-binqi as itching and pain. There will be swelling, infections in certain areas of the body and the skin can show different kinds of spots. During a buqi treatment the practitioner senses humidity and itching, and the patient can feel moisture leaving the body. Some patients can have a sticky kind of sweating that is accompanied with by a strong smell. Damp-binqi can have different causes. In a very humid environment humidity can directly enter the body. External humidity can also be an indirect cause for a humid environment creates a higher pressure on the skin, which the natural elimination via the skin of different kinds of binqi (including damp). In some diseases, e.g. eczema, damp-binqi is a residue of reactions of the immune system. Fire-binqi (huo): the pathogenic factor fire gives rise to a subjective sensation of heat in the patient as well as a radiating sensation of heat experienced by the practitioner. During a treatment the patient can feel heat moving down towards the hands and feet and sometimes they can see strong red spots beneath the skin. Fire-binqi is often linked with infections, both auto infections and exogenous infections. Emotional binqi: The patient can feel this as fixed or wandering pain in the chest cavity or in other areas of the body. The patient can feel very sad, depressed or angry or may experience other kinds of emotion. During a buqi treatment, the practitioner will experience emotional binqi as a painful, tingling or electric sensation. Under the kin of the patient’s hands, white blotches of gas may appear or a grey-blue colour. Emotional binqi results from different kinds of emotion. To take an example, anger-binqi is a gas that accumulates in the body. It often concentrates in the diaphragm and can be painful, It may affect the organs that surround it such as the stomach, the liver, the gallbladder. It can also move and affect other parts of the body. In the case of anger a gas is produced, but other emotions might be attended with the appearance of other substances that nevertheless may accumulate in the body and cause disease. The body has its own self-regulating mechanisms to expel binqi. A mentally and physically healthy person will eliminate binqi in a natural way. Simply we can say that binqi can move out of the body through the channels, whose exits are situated in the hands and the feet. The channels function as a way for transporting the energy substances from the blood to the organs (tissues) and for evacuating waste from the organs (tissues) to hands and feet. The channels circulate through the intermuscular spaces which are filled with body fluids. Because energy substances and binqi both reside in body fluids, we think that the movement of body fluids and binqi are linked. If the body fluids can flow freely to the hands and feet, then binqi can follow this movement. It is only when the natural flow and exits are obstructed that it will accumulate in the body. We can distinguish four steps in the process of exchange and transport of nutritive substances and waste products. Firstly the exchange between the cells and the intercellular spaces; secondly the exchange between intercellular and intermuscular spaces; thirdly the transport of energy substances and waste products from the intermuscular spaces towards the hands and feet, and finally the emission of gas-binqi (wind-binqi or emotional-binqi) via the skin of the hands and the feet, and the absorbtion into the blood of the non-gas-binqi (cold-binqi, damp-binqi or fire-binqi) via the micro vessels in the palms of the hands and the soles of the feet. Afterwards the passage of the blood through the liver causes the breakdown of the binqi and the waste products are evacuated with the urine. Breathing is the key to this process of exchange and transport, passing information from and to the internal receptors and the respiratory centres. From this information the high nervous system organises the reaction of the whole body. Usually breathing happens spontaneously, exhalation enabling the diaphragm to push the body fluids to their exits. Breathing can also be controlled by the mind. Deep exhaling exercises will increase the downwards pressure of the diaphragm, thus moving the body fluids towards the extremities with increased efficacy. Why do high volumes of binqi occur in the body? Several factors disturb the natural elimination of binqi. An excessively high production of binqi will make it impossible for the body to expel it in a natural way. An accumulation of binqi is the result. The mind has an auto-regulating function but an overactive mind looses this ability. An imbalance of mind and body is the result, including failure of eliminating binqi. Another factor is the lack of movement. It is common knowledge that lack of body movement is not good for health because the blood circulation and the intercellular metabolic exchange slow down. Shallow breathing and positive abdominal breathing, very common amongst most people in daytime, keeps the position of the diaphragm too high and diminishes the downward pressure that pushes binqi towards the exits. A very deep negative abdominal breathing will push the diaphragm downwards to a maximum. During the night, during deep sleep, the duration of exhalation is three times as long as the time of inhalation. That explains why the elimination of binqi is best at this time. Therefore unsufficiant sleep or not sleeping deeply enough will disturb the natural elimination of binqi. 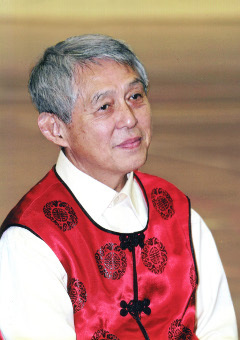 In the book, ‘Buqi, Chinese healing and self healing’, I wrote that prolonged poor body posture is the primary cause of disease because it disturbs the free flow of the body fluid and therefore provokes stagnation of binqi. A prolonged poor body posture will affect one or more vertebral bodies, resulting in abnormal pressure on the nucleus of the intervertebral disc. The nucleus has a spongy quality as it is filled with body fluid. If compressed over too long a period the process of endosmosis is obstructed. It becomes very difficult for liquid to enter the nucleus and the nucleus cannot return to its original state. This loss of vitality of the nucleus together with spasms in the neighbouring muscles cause narrowing of the corresponding intervertebral space. The circulation of blood and other body fluids in this area becomes disturbed, and as a consequence binqi stagnates in the intervertebral space. Moreover the narrowing of the intervertebral space may irritate the sympathic or parasympathic nervous system. This will influence the blood supply to the corresponding organs, and as a result binqi will stagnate in the organs and in the long-term give rise to disease. In the neck area, intervertebral arteries pass through the intervertebral foramen and transport blood to the brain. If a cervical intervertebral space narrows or if a vertebra is out of position, corresponding arteries can get touched or folded, disrupting the blood circulation towards the brain. As a consequence information transmission from the brain to the organs becomes incorrect, affecting the auto-regulating function of the body. The Buqi system developed out of research on binqi phenomena and the theory of the double vicious circle is its underlying theory. The system includes buqi-healing, buqi-daoyin, buqi-herbal therapy and others. 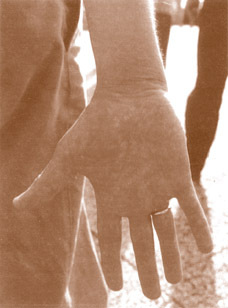 In Buqi healing the practitioner has more than 80 hand techniques at his disposal and uses different kinds of vital forces – which are in fact taiji forces – to transmit health information. These forces activate and regulate the functioning of different physiological systems in the patient. By transmitting the information of vibration, spontaneous movement and mental force, the movement of the body fluids improves and binqi is expelled from the patient’s body. 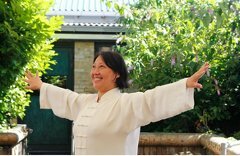 Buqi daoyin are a set of self-healing qigong exercises taught to the patients according to their specific problems, involving a combination of body movement, breathing and mental concentration in order to expel binqi. Moreover Buqi daoyin stretches the ligaments, opens the joints, corrects the body posture, improves the upward and downward movement of the diaphragm and generates emotional changes. In the west binqi is a new concept. In this article I primarily wanted to introduce the concept of binqi as part of the Buqi system. Buqi is as young now as was acupuncture 30 years ago when it was being introduced in the west. For most people it is totally new but one day people will recognise its truth and will love it because no needles are used, no touching is necessary and there are immediate results. I would like more people to research this, for the benefit of all humanity.